Tolstoy famously told Chekhov “your plays are almost as bad as Shakespeare’s, Anton Pavlovich." 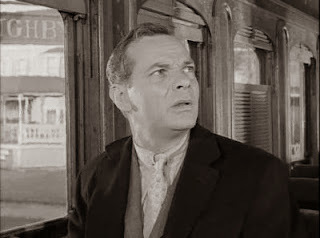 Which brings up the question of the A Stop at Willoughby episode of the Twilight Zone. Truly this is one of the great moments in television, telling as it does the story of a harried advertising executive who finds what he has always been looking for—death. This particular train ride is, by the way, real Mad Men territory. But the question is which is better A Stop at Willoughby or Hamlet? And there are those who might argue that Hamlet has to play second fiddle. Indeed, what we like about Hamlet, the ambiguities--is Hamlet mad or feigned? is Ophelia’s death an accident or suicide?--can be viewed as simply messy writing . Perhaps this was Tolstoy’s complaint. Willoughby deals with death head on and the message is clear. If you think you’ve found, paradise, you’re already dead since the peaceful idyll, where time seems to stop and simple pleasures take the place of continual strife and competition doesn’t exist here on earth. And while you’re at it, be sure to see The Monsters are Due on Maple Street, next to which Othello’s jealousy and paranoia are lame.